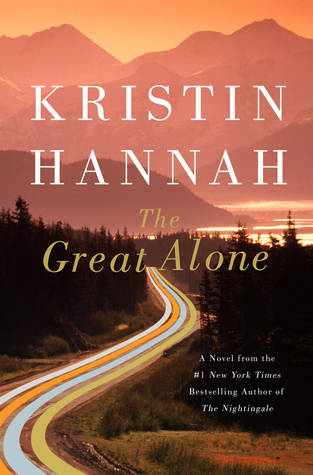 For much of the month of May, I listened to the audiobook The Great Alone, the latest novel by popular author Kristin Hannah. I previously read (and loved) her novels Firefly Lane (made me sob aloud multiple times) and Nightingale. This latest was similarly immersive and moving, set in the wilderness of Alaska and tackling the tough issues of domestic abuse, depression, and PTSD. In 1974, thirteen-year old Leni has grown used to her father's volatile moods and their family's constant roaming, never staying in one place for very long. Her mother says her father, Ernt, was different before the war. He was a POW during the Vietnam war, and now his temper is short and he doesn't trust anyone, least of all the government, but he loves Leni and her mom, Cora. So, Leni's not all that surprised when her father announces one day that they are moving to Alaska. He inherited a cabin from an Army buddy in a remote little town, and Ernt is certain their lives will be perfect in Alaska. With no preparation, they trade in their car for an old VW van and head north. The cabin turns out to be no-frills - no indoor plumbing, filthy, disused - and the community it is on the edge of barely qualifies as a town. But the people are kind and helpful and strong, and they pitch in to help the very unprepared new family get ready for the coming Alaskan winter. At first, things are good, even great. They all like their new life, and Leni think her dad does seem much happier up here, as they work hard through the long, sunny days to get the homestead ready. Once the unending dark days of Alaska's winter set in, though, Ernt's moods once again turn black, only now Leni and Cora are on their own, isolated in their small cabin with him. That's just the beginning of this epic novel that follows Leni from her early teen years through young adulthood and just the beginning of the family's struggles. Hannah depicts Alaska with depth and insight, filled with awe-inspiring beauties and dangers. Her own parents moved to Alaska in the 70's, and her experience with the state, homesteading, and its people comes through. It's the perfect setting for this story that delves deeply into difficult topics that aren't often explored so openly. There are passages of abuse that are difficult to read/listen to, but the overall story is so engaging and compelling that it wasn't a big problem for me (I had been avoiding this novel for that reason, but I am glad I finally listened to it). Although some might see Cora's devotion to Ernt as a weakness, she remembers the man he used to be, and, though the terms weren't used back then, he almost certainly suffers from PTSD and bipolar disorder. In addition to Cora and Leni, the novel is filled with other strong female characters who have made lives for themselves in the rugged surroundings. Besides the depth of the characters, this novel also features all kinds of plots twists that will keep surprising you. The Great Alone is a powerful, redemptive story of growing up in a difficult place with a difficult person and learning what really matters in life. Listen to a sample of the audio book, as Leni tells the beginning of her story. Or order The Great Alone from Book Depository, with free shipping worldwide. I have this one on my shelf and keep not reading it. I must read it soon! I read The Great Alone, but bet it was quite a different experience to listen to it. Like you I enjoyed the book, except for the last 20%. It just felt a little too neat and tidy for me. I wonder if the ending would have worked better on audio?